My new 2 x 4: Maximum Strength program is near completion. I will be releasing this program on March 10th. As you can tell, I’m extremely excited about this product. In fact, I think it’s my best work to date. 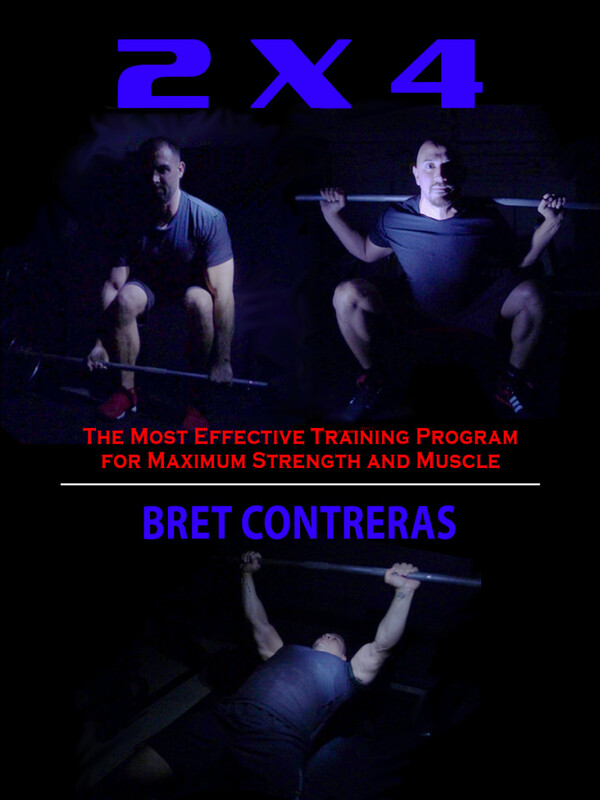 Though this product has the Bret Contreras name on it, it relies heavily on the knowledge I’ve gained from my training partners and colleagues. I can’t wait to help you get stronger and to advance best practices in training for maximal strength. The countdown starts today. T minus 40 days. YEAH! All the sections look really exciting! Looking forward to this! So excited to hear this…thanks Bret!! Bret, I hope you know I have nothing but the utmost respect for you. “The Most Effective Training Program for Maximum Strength and Muscle” designed by an adult man with a 400 pound back squat max. No offence, but let others come to the conclusion that the program is effective … why the hype? You called out Poliquin some time ago and accused him of being a “guru”, and I agreed with you. What would you call this that you are doing right now? Come on Ted, what does my squat have to do with anything? I’m 6’4″ tall with long femurs (I teach how anatomy influences joint torques in the manual by the way). In six months of training, my girlfriend broke the state record and raw squatted 225 lbs at a bodyweight of 118. Sammie raw squats 225 lbs too at a bw of 120 in 6 months of training as well. Andrew will probably hit 565. Joey is a 500 lb squatter. Rob is a 500 lb squatter. What’s important isn’t these individuals’ current strength levels; it’s how fast they’ve progressed. Anyway, what makes other coaches’ programs excellent – their strength? If that’s the case, just go search for Konstantin’s or Spoto’s routines, but I can assure you that these programs aren’t best for the masses. Or do you go by the strength gains a program elicits with the lifters who try the program? That’s what I’d prefer you judge the program by. Let’s say I got on steroids and trained in briefs, wraps, a belt, and a squat suit for a year, and got my squat up to 650 lbs. Would that make my program more effective? No, it wouldn’t. Maybe I could get my deadlift up to 700 this way too. The truth is, my strength has nothing to do with the program’s efficacy. Moreover, the coaches who tend to make the biggest breakthroughs aren’t always the strongest guys – they’re the weaker guys who are on a constant quest to increase their strength and discover the best training methodologies. If you try this program, you will gain strength, and you will love the program. Mark my words. By the way, other coaches have called their programs “the most effective” and I don’t find them to that highly effective for the masses. Nevertheless, I address some of this in the introduction to the book in a very professional and objective manner. I believe very strongly in this program, so I stand behind it. Last, I grilled Poliquin because of his pseudoscience, not because of his hype. I do not think it’s fair to put me in the same category. I completely agree with you, Bret! Some people think that to train world class athletes, you should be a world class athlete yourself. My belief is that to train world class athletes you should aim to be a world class strength coach – and you are doing a pretty good job there, sir! -Will it be self-published or through a publishing company (like Strong Glutes was)? -Who do you think is the target audience for this product? Lifters with a fair amount of experience? Beginners? Regular people with desk jobs and intermediate weightlifting experience? (*prays for the latter*). Sounds great Bret! Looking forward to the modifications for beginners as I have a 14yo that is working his way through some body weight basics that I am going to require before he starts lifting weights and he is almost chomping at the bit. I’m looking forward to reading about your program. From the information you have posted so far, it seems very similar to the programs I write for myself and my more advanced personal training clients. Sounds awesome Bret, looking forward! Is this product going to be sold in the form of an e-book or something similar? Is this a book? Can I buy it in Canada in 40 days?? I can’t wait!!! Yes Sarah, it’s an eBook, so you can buy it from Canada indeed. I’m usually a hard sell on these things, but knowing your level of professionalism and research I won’t be able to pass on this one. Thanks everyone for the support! It’s very appreciated. Looking forward to this. How much will it cost? Not sure yet Sandy…haven’t planned that part out yet. Wow this looks really cool, one reason I trust this website is because it really seems evidence based. At the gym I always feel like I what I work on is so randomand directionless, especially when it comes to upper body and back strength… is this something that people not really smart about gym routines will be able to do? Also people who are starting out without that much strength? Great job ! will it be released on amazon.ca ? how will it cost ? released on Human kinetics ? Thx and keep up the good work ! Niiiiiicee… finally something i’m RIGHT on, so i can full heartedly support you with buying (not that i wouldnt buy Strong Curves, but right now it’s not amongst my top priorities). OTOH a book thats read is not information of the book learned, but the energy/ideas of the author absorbed… so to speak. I’m curious to learn and try stuff. (for example: DeFranco’s Westside For Skinny Bastards III part – has some MAX EFFORT days that are devoted only on that. I THINK his ideas are best left untouched for the first few cycles/maybe year, but heck – sometimes you might wanna switch routine after a while and you could just add variation into it (like maybe the max effort days follow 2×4 template??) and not go through an overall overhaul – cuz maybe the program works great so far, or maybe it just needs some tweaking (mostly for CNS purposes for example). Overall like i said you’re the person to watch for now, cuz you’re still “on the path” and not “finished and satisfied” with the end point. Bring it on. Is this related to your PhD work? I doubt Angelo Dundee was the King of Boxing himself, but oh, what a coach! There is ZERO correlation between your maximum strength and how well you can get OTHERS to strengthen. One would think that would be obvious to every reader. BTW, off topic (sorta) the Israeli military often uses 18 and 19 year old female instructors for sniper instructors, as well as paratrooper training. It’s not that these women are physically strong, per se, but it becomes mentally difficult to not jump out of a plane when the 110 lb female instructor just did. Same goes with making the shot. Eliciting the best from others is a talent. Seems that you’re very good at it, kudos to you, Bret. You always take the high road when criticized. You are patient and explain things thoroughly and politely. I admire this. Yet another reason why everyone is inspired by you. Is this for gaining size or just strength? or have you noticed that the to follows? Second that, I’m interested in gaining as much strength as possible with minimal mass/hypertrophy/mTor activation. Is this product suitable for this? is it here yet? Today is Mar 10 and I’m looking for it and not seeing it? What is the new release date? Bret, is this available yet? April 14th. So sorry Anthony! a) I’m a competitive sprinter (at 52 years old) and don’t care about size, but I do care about strength… and I’m lower body/posterior chain focused. b) I’ve got a grade 2 spondylolisthesis and basically no disk between L5/S1, so I’m *trying* to put less load on my spine (I say “trying” because I LOVE squatting and heavy deadlifts, so it’s hard to quit… but I should). And, CONGRATS on what I know was a lot of work and what will be a BIG hit for you. Really excited for the release of this book, iv got very similar statistics at 6 foot 4, long femurs with a bodyweight of 227. I always find it fascinating to see how the tall guys lift, it was a great inspiration to watch your meet Bret.